Right before her birthday this year, my mom bought herself an Android-based tablet. Had it not occurred to her, I asked, that that would have made a good gift for one of us to give her? She was genuinely surprised because in truth the answer was no, it hadn’t occurred to her. My mother is the consummate consumer, which does not mean she buys a lot; it means she thoroughly researches everything before she purchases – anything. I probably wouldn’t have gotten her one anyway, for fear of getting the wrong one. Instead, I gave her an outing that I was pretty sure would appeal to her inner geek, a ride on a Segway. I considered renting one for a day and having it delivered to her house, but decided that it might be more fun if we did it together so I opted for a tour. 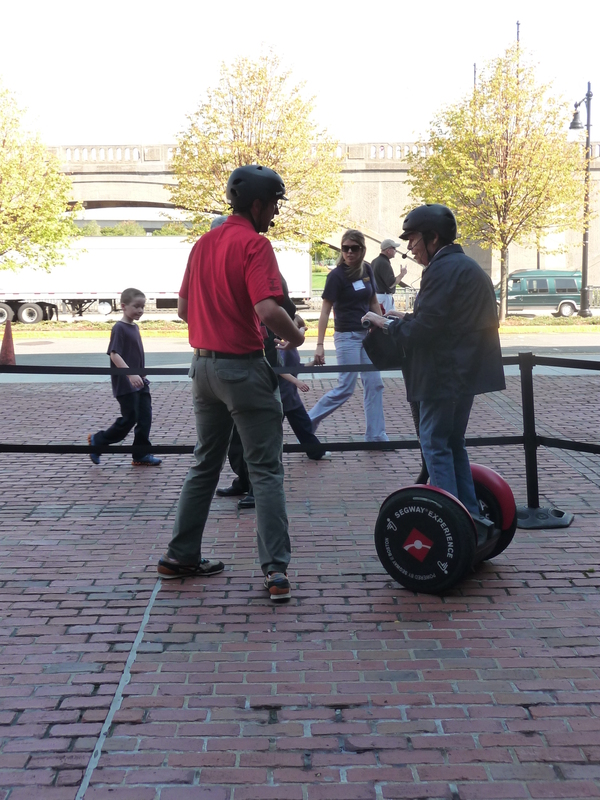 The tour operator, Segway of Boston, works with the Museum of Science and tools around Cambridge where it’s legal to ride on the sidewalk. The first half hour is for training. We watched a short video where an animated figure showed us all the things we shouldn’t do, lest we end up splat on the ground like he did. Then we were given a headset with an earpiece and a microphone. The receiver, clipped to our pocket, had a talk button on it. To use it, however, we’d need to take one hand off the handlebars, which was one of the no-no’s in the video. I resolved to keep my comments to myself. 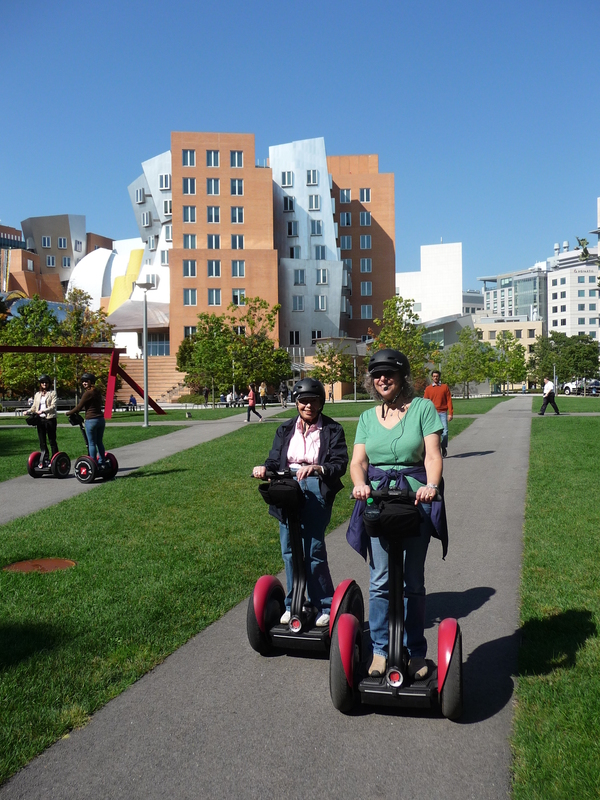 The hardest part of using a Segway turns out to be getting on, rivaled only by getting off. Apparently Segways are never really at rest; they are always moving, like a horse that’s new to being under saddle. In order to get it to stand still you need to have it perfectly balanced. If you push the handlebar forward it goes forward, pull it back it goes backward. Fortunately, the Segway can’t smell your fear, and once on, it didn’t take long before we were all happily scooting around the practice area. Then it was time to head out. The tour, led by a recent Skidmore graduate named Aaron, was a blast. He kept up an amusing and informative narrative. It wasn’t long before I was comfortable enough to use the talk button so I could let him know he was being appreciated. He took us across the Monsignor O’Brien Highway to North Point Park, a beautiful spot that we were told was created as part of the big dig. Then we went up to North Point Boulevard where they’re building the big skateboard park. After that, we crossed back over the highway and cruised down to Memorial Drive where he pointed out Beacon Hill across the river and told us about the buckets of tar that were lit in the event that the people needed to be alerted, hence the name. Next we rode into the MIT campus and paused for a break while Aaron showed us pictures on his iPad of famous MIT hacks. Then it was back to the museum. When personal Segways were first introduced, they cost about $30,000. Today, you can get a new one for $6,000 and a refurbished one for $3,000 to $4,000. If you calculate how much you spend in gas to run errands around town, it might take a while to pay for itself, but what’s it worth to not have to actually walk when you take the dog out? For all I know, my mom is already doing the research.